Boneschi is an Italian bodywork firm founded in 1919 and is still active, currently as part of the Savio group. The Outer Boneschi Srl was founded at the end of the First World War, based in Cambiago (MI). The founder, John Boneschi, first addressed his scope of action towards some cars prestige of the time, but without much luck. It was only in 1922 with the then innovative launching Lancia Lambda, that things began to change: Enrico Minetti, an agent Lancia to Milan and met with dintorni Boneschi and the latter informed of his plans to propose to clients then Lancia of products other than the usual, with custom coachwork. Boneschi proved interested and soon began producing a limited number Lancia Lambda bodywork by the Milanese designer. After a small parenthesis in which Boneschi also worked for the French Citroën, activity returned to the Lancia. We are in between the years'20 and'30. It was at that time Boneschi realized that some of his happiest masterpiece, based on the Lancia Dilambda, on 'Astura and the' Aprilia. The years immediately preceding the outbreak of the Second World War saw the carrozzeria Boneschi also interested in working with Alfa Romeo. It was in this period Alfa Romeo 6C 2500 custom coach builder in Milan. During the war the activity was suspended, partly because the plant reported damage of no small account. Ended the conflict, the establishment was called into the sixth and shoot with a new interpretation on an Alfa Romeo 6C 2500, which became among other car representation for some political figures of the time. Shortly after, in 1953, it was the turn of 'Alfa Romeo 1900, revised Boneschi and produced in duplicate. In the same year is a successful interpretation on a Lancia B53 Aurelia. 1957 saw once again Boneschi deal with an Alfa Romeo, specifically a Juliet ricarrozzata in un'inedita as small garden. In 1960 still an Alfa, this time a 2600 proposal is as coupe and as a cabriolet. The only Alfa Romeo cars discovered so far documented are the 2600 Spider (of which a copy is in Sicily) and Astral 1900 but do not know the actual Italian location of the sample. 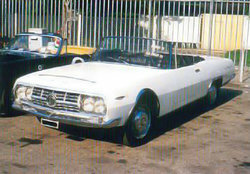 In 1962, was built instead a beautiful Lancia Flaminia Spider in collaboration with Rodolfo Bonetto. But at this point in the automotive sector began to run low, due to less demand. On the other hand, became more pressing demand on the industrial bodies, those of buses and trucks. 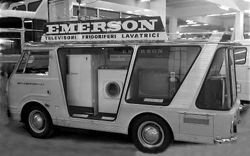 We are at this point in the'70s: the company Milan, converted to industrial bodies propose some re-based Iveco and OM. In the 80s there was a review on a Lancia Thema and then the company, which was sailing in good water, In the 80s there was a review on a Lancia Thema and then the company, which was sailing in good water, was detected by Carrozzeria Savio, a Turin that over time has had to suffer the same adjustments for industrial purposes that Boneschi has experienced the same. Among the other marks in the Boneschi looked in the past, still it is worthwhile to mention the Talbot, the Rolls-Royce and Fiat. Today the Boneschi is still active in the field of health care settings, commercial and protected (yours is the VM90 on the chassis IVECO), both in the rail sector. At the end of 2006 the factory town, located in Cambiago was sold by the Group Savio, who had already sold its plant in Turin, so far the only production of the company remains the establishment of Germatex Atessa, also in the process of be sold for the low workload. Boneschi of Savio and now remains the only brand, owned by the Group Savio, in turn controlled by a holding company with headquarters in Genoa, more dedicated to real estate business that productive entrepreneurship. Lancia Dilambda, Lancia Artena and Lancia Astura. Alfa Romeo 1900C Astral (1953), displayed at the 1953 Turin Motor Show, a second was sold to Trujillo. Alfa Romeo Giulietta Weekendina (station wagon, 1957). Lancia Thema Gazella coupe prototype (1987). Boneschi has recently been acquired by the Milano-based Savio coachbuilder.